The new Hostal Flor de mi Tierra invites you and your family to spend unforgettable days with the beautiful view of the Titicaca lake. We offer you a cosy place with common areas, a beautiful terrace to enjoy the magic Andean landscape. We count with all the services you need to make of you stay a pleasant time, with all the comfort a joy. 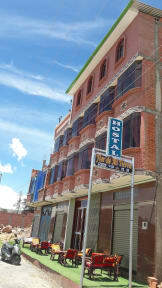 Our hostal is very close to the centre, you can come walking.There are some awesome places to visit . Different tracking routes in wonderful landscapes, mountings like: Cerro el calvario, Cerro la Horca del Inca-Pachataca. You can also visit the beach Playa Blanca, Islas flotantes, and we can recommend you motorcycle routes. 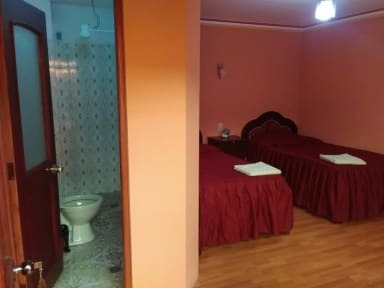 The rooms have beautiful views, DVD for you to choose a good movie for entertainment, clean bathrooms, comfortable beds. You will feel relaxed and comfortable.